Book Adventures: (YA) Ice by Sarah Beth Durst + Recipe & Giveaway! 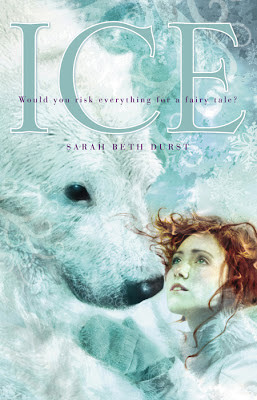 (YA) Ice by Sarah Beth Durst + Recipe & Giveaway! Click image for participating blogs. 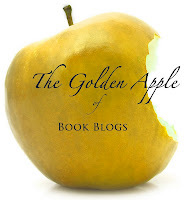 Welcome to another blog hop! This one is brought to you by I Am A Reader, Not A Writer and The Mod Podge Bookshelf. 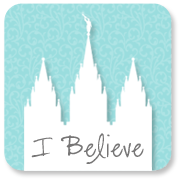 For participating blogs, please click the hop image (left). This giveaway is centered around the awesome YA author, Sarah Beth Durst, who's got 6 books out now, the newest of which is Vessel (Sept. 2012). You can read my past feature of her fun and refreshing vampire romp, Drink, Slay, Love, here. 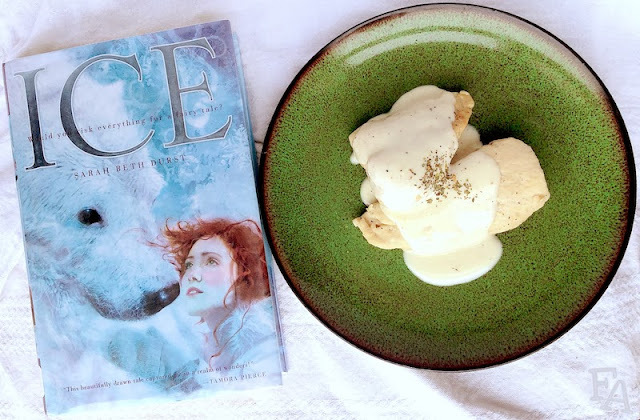 This post features another one of her books, Ice, which is parts "East o' the Sun, West o' the Moon"/"The White Bear King"/"Valemon" & other fairy tales in the animal husband type and parts "Beauty & the Beast" and it's equivalents. 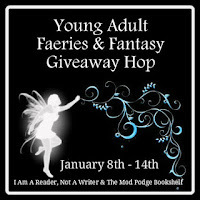 For the giveaway, enter via the Rafflecopter form at the end of this post. 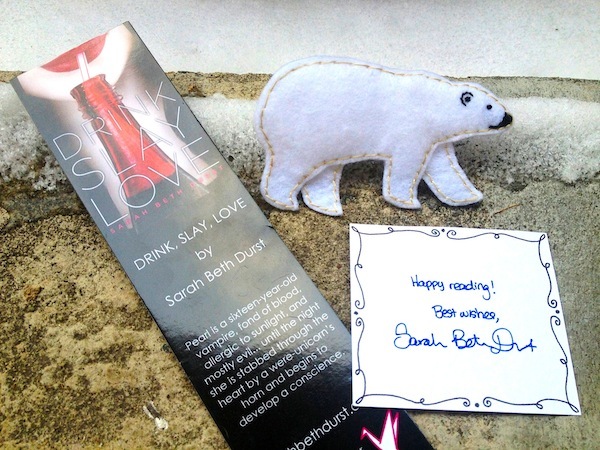 I'm giving away a bookplate autographed by Sarah Beth Durst, a Drink, Slay, Love bookmark, & a handmade (by me) felt polar bear pin! And for a runner-up winner I'm giving the same bookmark and another autographed bookplate! So TWO WINNERS! Read the prologue & first two chapters of Ice! I love Sarah's writing style. It's so direct and to the point, very concise with great word choices for description and setting. The environments in this story are written in such a simple yet rich way that the reader feels embraced by them. You can tell that a ton of research went into this story on topics such as Arctic wildlife, Alaskan environs, expeditions and scientific research, and the Inupiatun language--the word "munaqsri" (moon-awk-sri), which is the main species of fantastical entities in the book, means "caretaker" in Inupiatun, and that they are. They care take souls at birth and death. The main character, Cassie, is another example of what a strong female lead Sarah can write. The trials and hardships Cassie endures are excruciating and the choices she makes are filled with almost palatable determination. I can sympathize with some of her thoughts during certain situations, which made parts of this story resonate with me. Combine that with the raw imagery and inner struggles of Cassie and it mounts this story on a very real and solid level. Ice is an intelligent book, fantasy entangled in science and humanity. Lots of different foods are mentioned in Ice, some that you might like to try, some that you might not, and some that would be very hard to come by! 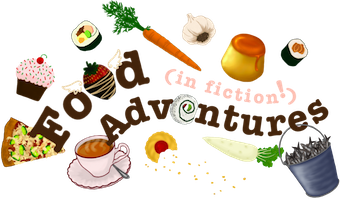 The foods serve to show comfort and the facade of comfort, the contrast of rich foods verses common or the differences in what certain settings/characters can provide, desperation and providence, and other themes, I'm sure! We've got (not in this order) raw seal, beans & rice, dried fruit, bread loaves & rolls, muffins, a raspberry tart, hot chocolate, knock out tea (probably with extra Valerian), calming tea, vegetable stew, polar bear milk, roast rabbit, wine, and bread that tastes like honey. Cassie's favorite though is chicken soaked in wine. Click the image below to go to my recipe (I also made a white wine cream sauce). In honor of the awesomeness that is Ice, I've made a polar bear pin out of felt! One winner will get the pin + a bookmark + a bookplate while another winner will get a bookmark + a bookplate! So TWO winners! US only, please. Just wanted to say how incredibly talented you are. The polar bear book mark is made of awesome! OMG the polar bear! Soooooo cute. Thanks! And thank you for visiting my blog!